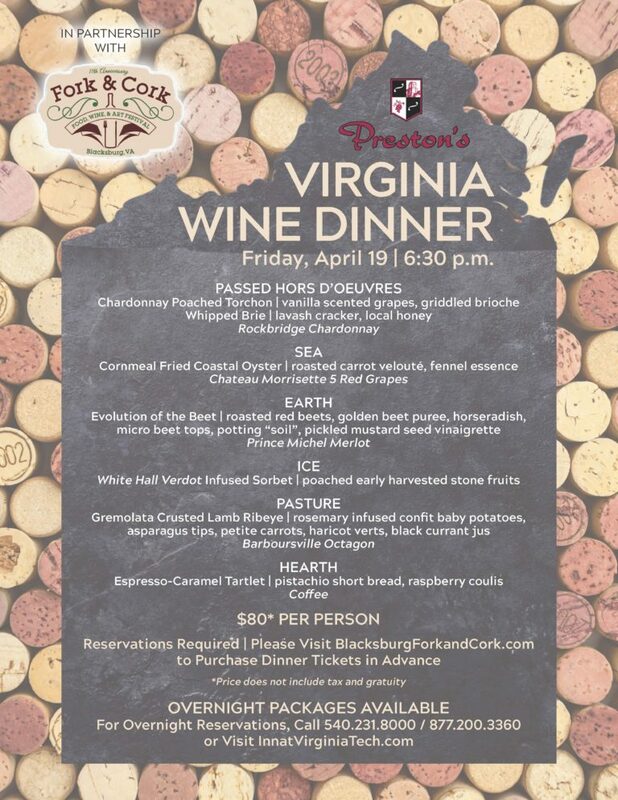 The Inn at Virginia Tech and Blacksburg Fork & Cork present the annual Virginia Wine Dinner on Friday, April 19, 2019 at Preston's Restaurant inside The Inn at Virginia Tech and Skelton Conference Center. Enjoy six delicious courses and perfectly paired Virginia wines. Learn about pairing food with wine and current trends as our experts present each dish. Don't miss this exciting culinary experience! The annual Wine Pairing Dinner is hosted each year the evening before the Blacksburg Fork & Cork wine festival. The cost is $98.64 per person and advance reservations are required. Price includes tax and gratuity. To purchase tickets online, visit: https://www.freshtix.com/events/11th-annual-blacksburg-fork--cork. Overnight packages are also available at The Inn at Virginia Tech. Call 540-231-8000 or visit https://www.innatvirginiatech.com/blacksburg_hotel_accommodations/guest_rooms/ to make a reservation. To view the full menu and event flyer, visit: https://i.imgur.com/X4MYc6m.jpg. For more information on the dinner, visit: https://blacksburgforkandcork.com/wine-dinner/. For more information on Preston's, visit: http://www.innatvirginiatech.com/blacksburg_restaurants/prestons/ or https://www.facebook.com/innatvirginiatech or call 540-231-0120.